Deadtime Stories was available as a giveaway on March 18, 2018! How would you improve Deadtime Stories? As yesterday, I'm away all day visiting family. I'm not getting back home until very late evening, so moderation will be basic. Hopefully, there will be no problems. If there are I will endeavor to post fixes/suggestions once I return. Review accessed HERE 17th February 2018. 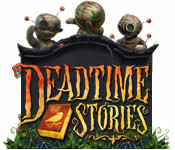 Deadtime Stories will thrill hidden object fans but story not for the faint of heart. Hidden object fans with a fear of all things creepy are going to find themselves forced to make a tough choice. Deadtime Stories is a marvelous, challenging stunner of a game, but its voodoo-rich story is almost sure to send a chill down your spine. Do not expect to hear Jessie Bodeen’s tale and emerge unscathed. Jessie is just one of the residents of Edward Blackgate’s special cemetery waiting to share her story. A rich white woman hires voodoo queen Jessie to cast a curse on her rival, to keep her out of that season’s parties. At first, Jessie refuses – such magic is evil – but eventually can’t refuse the princely sum of $150 for her efforts. You’ll have to follow Jessie’s path yourself to learn the rest, traveling throughout New Orleans, learning voodoo spells, and communing with spirits. The drama unfolds via still drawings in cut scenes, and while the accents are a bit dubious at times, for the most part the voice acting is convincing. Deadtime Stories is a well-balanced blend of hidden object searches and adventure game style puzzle solving. Each level is structured generally the same: You must gather ingredients necessary for creating one of the potions in Jessie’s book of voodoo, then use the potion to learn the next part of her story. 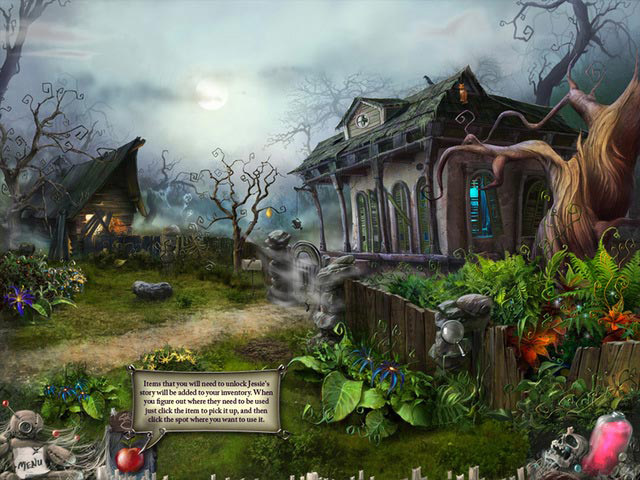 You’ll come across some of the requisite items during the hidden object levels, which you’ll revisit several times over the course of the game. Some of the things you have to find are pretty gruesome – no great surprise, given that you’re in the heart of voodoo territory – but the shopping lists vary nicely from search to search, so they never feel too repetitious, even when you’re coming around for your second or third look. The clues were occasionally somewhat frustrating, at times because they were too vague (what’s an “ornament”?) or because the game’s historical setting made it tough to guess what the item in question looked like. Maybe you know what an inhaler from the 1800s looks like, but I sure don’t. Using a rechargeable hint solves those problems easily, however. 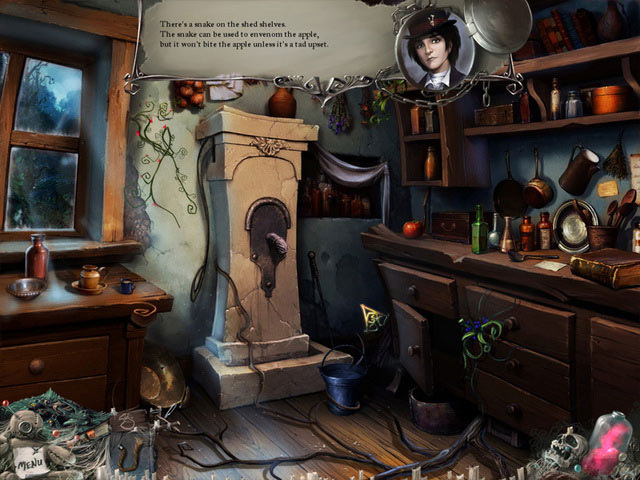 Deadtime Stories‘ hidden object levels are very well done, but they’re nothing compared to the game’s puzzles, which are wildly imaginative and challenging. Even when they lean towards the more traditional – like unscrambling letters to reveal a message – they’re given a clever twist that makes them feel completely fresh and vibrant. The puzzles are skippable after a short period of time, or you can also get a hint to help nudge you in the right direction. You’ll have to do a fair bit of backtracking to collect the items you need to create the potion or solve a puzzle, but the game does its best to help you by highlighting areas that need your attention with a purple glow. In case you thought I was joking about Deadtime Stories‘ creepy nature, let me be absolutely clear about it now. If you are at all offended or frightened by the practice of voodoo or black magic, you will probably want to steer well clear of this one, brilliant though it may be. Skulls, serpents, loa (voodoo spirits), curses, ghosts, chicken heads, poison, blood: you name it, Deadtime Stories has got it. While that will undoubtedly make some players uncomfortable, it adds an authenticity to Jessie’s story that cannot be denied. My sole complaint about Deadtime Stories is that it’s a bit short, clocking in at perhaps 3 hours. The story was so enthralling, it felt like I was done in five minutes, however. The one consolation is that Jessie’s tale seems to be the first in the Deadtime Stories series; there are many other ghosts in the graveyard, after all, each with their own story to tell. I tried to download this game yesterday but was warned on-screen that the registration part for the game was not working. I could not download it, so will there be another chance to do so any time soon ? I also looked at the Big Fish reviews and was intrigued when they were overwhelmingly positive. I like this type of game, so I usually check them out even if the reviews are mediocre. Well, this one does not disappoint. I was just going to play long enough to make sure all was okay and stayed much longer than I intended. It has great graphics, an interesting story line, and there have been some unique puzzles so far. Thank you GGOTD and MPC for another keeper. Whiterabbit, I hope things are getting better for you and your family. I also looked at the Big Fish reviews and was intrigued when they were overwhelmingly positive. I like this type of game, so I usually check them out even if the reviews are mediocre. Well, this one does not disappoint. I was just going to play long enough to make sure all was okay and stayed much longer than I intended. It has great graphics, an interesting story line, and there have been some unique puzzles so far. Thank you GGOTD and MPC for another keeper. Whiterabbit, I hope things are getting better for you and your family. Downloaded and installed, haven't had chance to play but after reading the reviews I think its my type of game! Thanks GOTD & MPC!! Hi, the Game looks and feels charming.., hmm, one of those early (this one dating back to 2010), almost classic HOGs, until you start playing it and realize how the idea of finding hidden objects worked then (the harder the better?:).. Not in all of them has to be said, but in this particular instance - making it indeed hard as heck to find anything, plus dead slow hint button (pink bottle), and 'primitive' info system - results in complete lack of expected speed where story-flow goes, I'm afraid. If anything, once you get into first scene, after spending over good half hour in that garden shed, being sent back and forth to the front of the house to fetch something to make magic potion (in itself familiar pattern in HO Games, only here hindering flow to no end).. you might as well be wondering is there any point to carry on further? To be honest I felt tired and annoyed completing just that first task! So hands up: Not what I was expecting from this Game, but who knows, might be someone else's cup of tea?? Not to appear 'mean' to Creators - Interesting concept and graphics, wish the rest of it matched intended charm and magic..
Hi, the Game looks and feels charming.., hmm, one of those early (this one dating back to 2010), almost classic HOGs, until you start playing it and realize how the idea of finding hidden objects worked then (the harder the better?:).. Not in all of them has to be said, but in this particular instance - making it indeed hard as heck to find anything, plus dead slow hint button (pink bottle), and 'primitive' info system - results in complete lack of expected speed where story-flow goes, I'm afraid. If anything, once you get into first scene, after spending over good half hour in that garden shed, being sent back and forth to the front of the house to fetch something to make magic potion (in itself familiar pattern in HO Games, only here hindering flow to no end).. you might as well be wondering is there any point to carry on further? To be honest I felt tired and annoyed completing just that first task! So hands up: Not what I was expecting from this Game, but who knows, might be someone else's cup of tea?? Not to appear 'mean' to Creators - Interesting concept and graphics, wish the rest of it matched intended charm and magic..
Nice comments & write up. Like the internals of the game design allowing for skips & hint recharges. Yes creepy stories aren't for everyone but hey like they say about films, it's just fiction fun. Layout and graphics appear fresh. Not too much to d/l so worth a shot. Thanks GOTD. Thank you GOTD and MPC. I downloaded this no problem on Win 7. Plays well. Was only going to play for 1 hour and played for 2.. Enjoying the game a lot. Have not come across any issues. I like the fact that some of the hidden objects are a challenge to find. Great graphics with puzzles that are just hard enough and not the usual ones. Would like to see more like this one where the hidden objects fit the scene instead of a jumble of anything and everything in the wrong sizes and genre. According to the Big Fish Games reviews, this seems like a fantastic game in the genre and will be trying it soon. Thanks GOTD! Enjoying this game a lot; takes some thinking, but not too much for a lazy Sunday :). I do prefer my HOG/adventure games (my favorite genre) to have some other kinds of puzzles, but the searching for ingredients for various potions is a nice addition. Which brings up the one pet peeve I have about this site: I see a lot of downvotes (earlier over 40% negative and even now about 1/3) yet no explanations about what those folks didn't like. It seems logical that anyone downvoting should just take a minute to post what they hated about a game, which gives us a chance to decide whether or not to give it a try. Thanks, GGOTD, MPC, and WR for a fun game for a cold Sunday! Enjoying this game a lot; takes some thinking, but not too much for a lazy Sunday :). 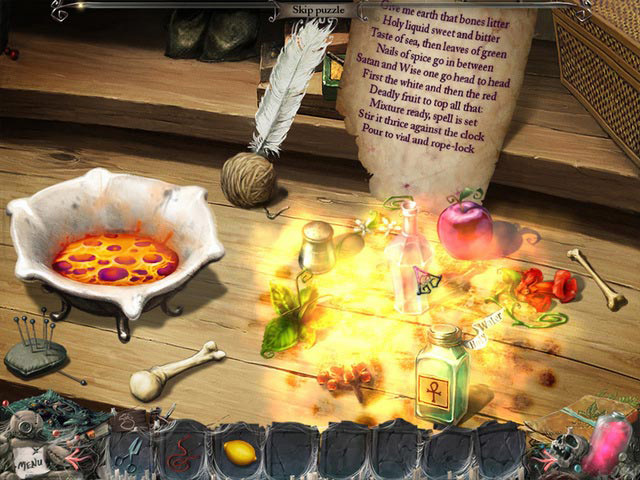 I do prefer my HOG/adventure games (my favorite genre) to have some other kinds of puzzles, but the searching for ingredients for various potions is a nice addition. Which brings up the one pet peeve I have about this site: I see a lot of downvotes (earlier over 40% negative and even now about 1/3) yet no explanations about what those folks didn't like. It seems logical that anyone downvoting should just take a minute to post what they hated about a game, which gives us a chance to decide whether or not to give it a try. Thanks, GGOTD, MPC, and WR for a fun game for a cold Sunday! neme, It seems that many of those "votes" are simply trolls who haven't even bothered to try the games but who simply downvote EVERYTHING "for the giggles". It's too bad, but it's a cultural phenomenon we have to end up living with. neme, It seems that many of those "votes" are simply trolls who haven't even bothered to try the games but who simply downvote EVERYTHING "for the giggles". It's too bad, but it's a cultural phenomenon we have to end up living with. neme, A lot of the votes are just those that don't like the genre. They expect their favorite genre(s) to be the only one(s) given out and vote down immediately when it's a genre they don't like. For the past few weeks, every time I try to install any game giveaway, I get a pop up message saying the giveaway has expired even though I is well before the deadline. Any suggestions? This happens to me sometimes when didn't care where unzipped the game. Just try to use a separate and unique folder for each unzipped game (named game1, game2 etc). Aaron, have you checked the time on your computer? Sometimes having the wrong date does odd things to various programs. This is great, thanks GGOTD and MPC. I do enjoy a good HOG game with challenging puzzles. This is great, thanks GGOTD and MPC. I do enjoy a good HOG game with challenging puzzles. Edited later to add that this is a really good game. The graphics are excellent, the challenges within the game are tough but not so hard as to be off-putting. HOG scenes are also unusual, and some of the items are very well hidden.The puzzles and games take some thinking, and are not run-of-the-mill stuff that I've seen before. The hint button isn't quick to refresh, but it's possible to see the last hint if you've forgotten exactly what it said. As for the theme - well, it's unusual, but there's a nice moral twist at the end. I do hope GGOTD and MPC team up to give another of these. Edited later to add that this is a really good game. The graphics are excellent, the challenges within the game are tough but not so hard as to be off-putting. HOG scenes are also unusual, and some of the items are very well hidden.The puzzles and games take some thinking, and are not run-of-the-mill stuff that I've seen before. The hint button isn't quick to refresh, but it's possible to see the last hint if you've forgotten exactly what it said. As for the theme - well, it's unusual, but there's a nice moral twist at the end. I do hope GGOTD and MPC team up to give another of these. Thanks GG. Just my sort of game. Downloaded and installed no problems (Windows 10) Good graphics with bright colours. I have just played enough to get the first amulet so far, it's challenging, but not so hard that I lose interest, I'm going to enjoy this one! Unzipped everything to the same location, looked like everything was going smoothly but it only activated the game, won't install it. The README file only mentions possible issues with antivirus. It seems I need some voodoo just to get this to work. I also need more motivation, which I don't have. I can find this same game elsewhere for free. Tom Brewer, if the activation APPEARS to work, but you don't then see the more familiar Windows installer dialog afterwards, then yes your AV has prevented the activation from running the unlocked installer. What you need to do is to get all set to push the button on the SETUP, and at that point temporarily switch your AV off. After activation, and once the 'real' installer dialog appears, you can re-enable your AV. If it helps, I use AVG and it is specifically the Behaviour Shield which needs to be turned off for the duration of the activation. Tom Brewer, if the activation APPEARS to work, but you don't then see the more familiar Windows installer dialog afterwards, then yes your AV has prevented the activation from running the unlocked installer. What you need to do is to get all set to push the button on the SETUP, and at that point temporarily switch your AV off. After activation, and once the 'real' installer dialog appears, you can re-enable your AV. If it helps, I use AVG and it is specifically the <b>Behaviour Shield</b> which needs to be turned off for the duration of the activation. If you look in the folder there is an installation instruction text file. you have to also install the resources exe included. Tom Brewer, your issue sounds exactly like the one OFTEN discussed here. Did you try temporarily deactivating your antivirus, installing, and then reactivating after everything is completed? for instance, with Avast, right-click, choose "disable for 10 minutes" and install and activate the game. Then right-click again and re-enable Avast. More info in the FAQs. Hope this helps (as opposed to nasty responses, which really don't enlighten and kinda smell up this friendly place :). Thanks for today's review, Mr. Whiterabbit and to GoTD & and MyPlayCity for today's giveaway. So happy to see a HOG like this available today! Excited to try it out since the puzzles sound like they're challenging and the hidden objects unusual - nothing bad about learning a new word too. :) Plus, creepy is always in for me. ^_^ Thanks for today's review, Mr. Whiterabbit and to GoTD & and MyPlayCity for today's giveaway. I'm wondering why my Webroot security system keeps stopping these games from being installed. Last week's game was big so I decided to download directly from website and again could not install the game as webroot again stopped. Indicates a Trojan and right now is again, scanning my whole system. What is My Play City doing?